And I explained in detail what that looks like and how it’ll help you to get the outcomes that you want, need and deserve for your critically ill loved one and your family! 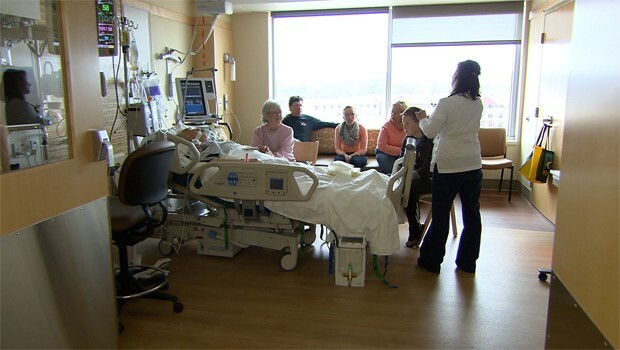 Families of critically ill Patients in Intensive Care are sticking together, no matter what and they are not intimidated by the Intensive Care team! This one really stands out! And it usually makes all the difference! If you and the rest of your family are sticking together during times of crisis no matter what, you’ll make all the difference and you will be able to make informed decisions, have peace of mind, control, power and influence! Furthermore, I know from experience that 99% of the families of critically ill Patients in Intensive Care are intimidated by the Intensive Care team’s “perceived power” and their “perceived authority”. The few families in Intensive Care who make informed decisions, get peace of mind, control, power and influence are not intimidated, they are the master of their own destiny and they act accordingly! Simple, but not necessarily easy! What I have also found over the nearly two decades of working in Intensive Care in three different countries, where I also worked as a Nurse Unit Manager for over five years and where I literally worked with and looked after thousands of critically ill Patients and their families and with now also counselling, consulting and advocating for Patients and families in Intensive Care on a daily basis in my own practice, families of critically ill Patients in Intensive Care who stick together and act as a united front during times of crisis, irrespective of whether they have difficult Family dynamics or whether they have any other Family issues. Those families know and understand that those issues or difficult dynamics need to be laid to rest during times of crisis and that the only thing that matters is their critically ill loved one and their well-being! I have seen far too many Families of critically ill Patients in Intensive Care who are unable to put their Family issues and Family dynamics aside during times of crisis and act as a united front. This usually doesn’t serve anyone and more importantly your critically ill loved one is the one suffering from this disharmony! As I have mentioned briefly before, it’s nothing to be ashamed of having family issues or family dynamics that are difficult. Every Family has those dynamics, period! But because your, your Family and your critically ill loved one are facing a situation that is unique and is in fact a “ONCE IN A LIFETIME” situation that you know you can’t afford to be getting wrong, you need to find a way of putting those Family issues and Family dynamics aside and act as a united front in the best interest of your critically ill loved one! If you do that you’ll also act in the best interest of your Family. After all your Family is very important and even if you have issues and dynamics that you and the rest of your family don’t like, maybe this is the time to reconsider how you are dealing with those issues and dynamics. Why having a loved one critically ill in Intensive Care is a ONCE IN A LIFETIME situation and why YOU can’t AFFORD GETTING IT WRONG! Furthermore, if you and your Family are united, stick together and act as a cohesive team, it’s so much easier for you and your Family, to have control, power and influence when dealing with the Intensive Care team. If you and your Family are a cohesive and strong team it is so much easier for you to make informed decisions, get peace of mind, control, power and influence and get the outcomes that you want! Speak with one voice, be clear and non-ambiguous in what you want! Speaking with one voice, knowing what you want and clearly express what you want and not having other family members questioning or interfering in those dynamics is extremely important in this unique and difficult situation. And especially during this time of crisis and during the times when your loved one is critically ill in Intensive Care it can and usually does make all the difference. Once again, there is a clear and measurable difference in how much control, power and influence you have, not only when dealing with the Intensive Care team, your critically ill loved one will also feel when you are one united front and your critically ill loved one will feel that you and your Family only have his or her best interest at heart. Show to the Intensive Care team that you are not intimidated by them! I can’t stress enough that 99% of all families of critically ill Patients in Intensive Care are intimidated by the Intensive Care team’s “perceived power” and “perceived reality”! If you show to the Intensive Care team that you are not intimidated it’ll make all the difference to the outcomes and treatment you will get for your critically ill loved one! 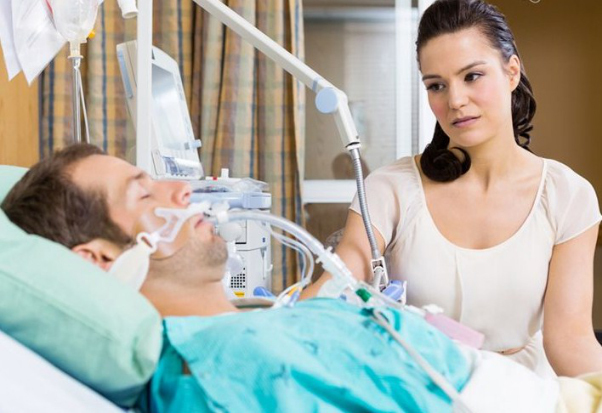 For example if you get told by the Intensive Care team that it might be “in the best interest” to “withdraw life support” and in essence “withdraw treatment” on your critically ill loved one against your and your loved one’s wishes and you make it very clear that you don’t agree with it, it can and will make all the difference. The Intensive Care team expects you to behave like the 99% of the families in Intensive Care and they expect you to “give in” and they expect you not to question. That’s how passive 99% of the families of critically ill Patients in Intensive Care are! They still believe that doctors are “God” and they still believe that the doctors opinions are the only opinions that matter! Do whatever it takes and act and behave accordingly. For example, change your belief system, change your body language, your tone of voice and make strong eye contact! Have good posture! Stay positive no matter what! Challenge any negativity that comes your way! How do you do that? I’m glad you asked! Rally your Family together and make a positive impact! Many Families who can’t put their Family issues and Family dynamics aside during the times of crisis often have a negative impact on their critically ill loved one’s recovery, because their critically ill loved one consciously or subconsciously feels the disharmony and he or she is therefore not recovering as quickly as he or she could do. Sometimes your critically ill loved one may even deteriorate, recover slower or even die because of the disharmony within your Family. Also, imagine your critically ill loved one is in an end of life situation. You and your Family don’t want your Family dynamics or your Family issues dominate an end of life situation. Unfortunately, this is what often happens when critically ill Patients in Intensive Care approach their end of life. There often is no peace and no harmony. If you, your Family and your critically ill loved one are in the unfortunate and tragic situation that your loved one approaches their end of life in Intensive Care, your main goal should be to facilitate a peaceful and harmonic death for your loved one. You, your Family and your critically ill loved one want to make informed decisions, have peace of mind, control, power and influence. You don’t want your family dynamics and family issues dominate the situation. I have been involved in many situations, either end of life situations or other situations in Intensive Care, where the Family dynamics and the Family issues were so difficult, that situations were getting very chaotic and were almost impossible to manage and this usually leaves a bitter taste in everybody’s mouth and it usually doesn’t help anyone. Peace and harmony are critical in such a difficult situation and you and your Family can usually only achieve it if you have unity! Also, if there is unity, it’s also better to look at alternatives such as INTENSIVE CARE AT HOME services in end of life situations but also in other situations like long-term mechanical ventilation and/or long-term life support! Intensive Care is a very stressful environment and usually any non- clinical issue, which is what Family dynamics are, only make it more stressful to the detriment of all parties involved. Also, imagine, your critically ill loved one is in a very difficult and very critical situation. And as I have said in some of my other Ebooks, the health professionals in Intensive Care have their own ideas and their own agendas. As you may know by now, there are a lot of moving parts and politics behind the scenes that you are usually unaware of that the Intensive Care team is trying to keep away from you at any cost. You may have gotten some more insight by now and if for example the Intensive care team wants to limit or withdraw treatment for your critically ill loved one in Intensive Care, but you don’t want to have the treatment of your critically ill loved one limited or withdrawn and if other Family members think that it’s the right decision- once again- the situation could become very difficult if not chaotic to manage and usually the situation can get easily out of hand. The person who suffers the most is then your critically ill loved one, because he or she is in the hands of other people! If you and your Family on the other hand are united, speak with one voice and you stick together no matter what, you will have a much easier task at hand to make your views and concerns heard and you’ll also have a much easier time to control the outcomes that you want, you will have real power and you will be able to influence the decision making process around your critically ill loved one’s care! You, your Family and your critically ill loved one will be viewed very differently by the doctors and by the nurses in Intensive Care, you can believe and trust me on this one. Whilst the doctors and nurses in Intensive Care are certainly trying to deal with your loved one’s clinical issues in the first place, messy and difficult Family dynamics usually distract everyone, from focusing on the main task, which is your critically ill loved one’s well being and their recovery! So, the bottom line and the main message here is to get your act together, leave the Family issues and Family dynamics alone and stick together no matter what! You will see the positive difference this will make for all parties involved, period! Your ability to “read the play” so to speak and your ability to interpret information correctly will make all the difference! So look out for PART 3 of “The 7 things families do who make informed decisions have PEACE OF MIND, are in control, have power and have influence, whilst their loved one is critically ill in Intensive Care (PART 3)” it’ll be there for you next week!